Merian-Webster definition of sfumato is as such: the definition of form in painting without abrupt outline by the blending of one tone to another. Sfumato comes from then Italian word of “sfumare”; “to tone down” or “to evaporate like smoke”. The most prominent practioners of this particular painting style is the beloved Leonardo di Vinci. Many of his pieces exemplify this technique, the most famous being the ‘Mona Lisa’. Another exemplary subject matter is of the Dutch and Flemmish Masters in the 14th through the 17th century (example: Willem Kalf, famous still-life master, was born in 1619 in Rotterdam) with their famous still life’s. Even though the Italian masters have been stupendous with still life’s, the Netherlands has produced the most famous still life artist to date, even Rembrant van Rijn participated, in ‘Still Life with Peacocks’ in 1639. Back then those were simpler times. Artist didn’t have cellphones, computers, and could not even go to the store and buy paint, they made paints AND brushes in the studio/sallon. “Where is this history lesson going?” you may ask. Tricia Ratliff, of course! The complex painting style and her “back-to-simple-times” subject matter and the beautiful combination of the two. In the previous blog (It’s Never Too Late To Learn: The Art of Debra Keirce) I was fortunate enough to get to interview Keirce about her art, and Tricia Ratliff allowed me to do the same. Here’s her wonderful response to the questions I presented with, yet with is interview, the response was more formal. “Yes, I’ve always loved art and have been intrigued by visual information. I can even remember the first time I saw somebody render something when I was a child and was intrigued by the possibilities of drawing as well as the beauty communicated with a world of color. As a child we lived in a stimulating historic district among Victorian homes along with 17th and 19th century architecture, local theatre and the arts. I was naturally inspired to sit outside draw things like architectural elements on the buildings , awnings, turrets, beautiful windows, small footbridges and unique texture that homes take on as they age. From an early age I sensed the life of things and the cycles of decay and renewal that makes our visual world so textural and beautiful. Even though I was drawing and working in color for a long time, I still remember the day that I discovered there was an occupation called “Artist”. Someone approached me while sitting on the sidewalk drawing the music Hall and asked me if they could purchase my artwork. The realization that other people valued these small captured images was so moving that started thinking not only of my personal enjoyment but in what I can share or leave behind for others. Later in life I was asked if I was born with some type of gift. Frankly, I don’t think that’s the way the gift of art works – I think the gift is that artists experience such intense pleasure from the moments we spend observing, capturing and sharing what we do that we want to do it again and again. That enjoyment is such a powerful charge and a gift to us that we want to keep doing it for the rest of my lives. As a result we are constantly learning in our pursuit of New ways to embody sights, emotions, people, textures, concepts or places. Right now much the narrative meaning in my work finds its outlet through still life. In the quiet of the studio I have time to carefully reflect on things that are most important. the objects construct into a quiet internal world that can enjoyed for its simple beauty or the viewer may be entertained by their deeper meanings. 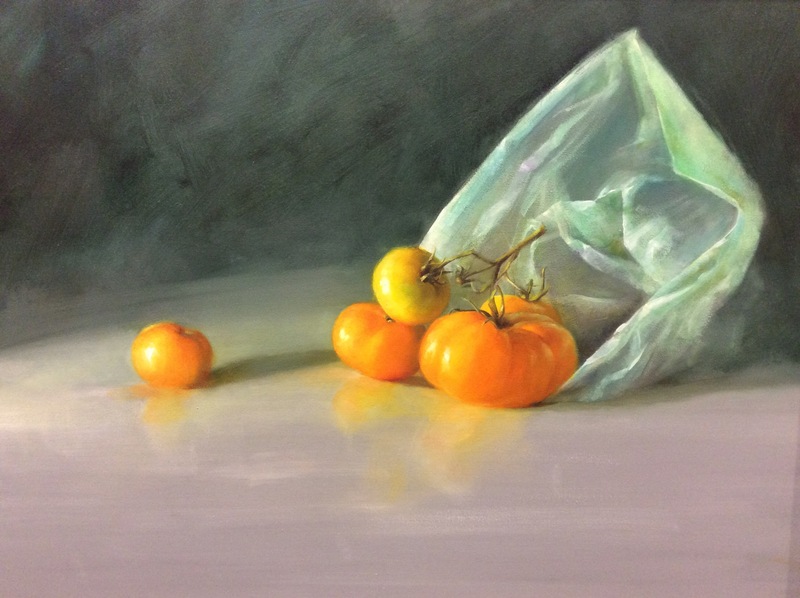 I’m exploring this duality as I paint not only still life but also other subjects. The techniques used in my work vary based on the subject and the purpose of each work of art. While I employ painting approaches passed down from master artists to learners over the past few hundred years I also heavily use techniques that depend on pigments and other materials that have only become available in the last century. We live in a time of great artistic growth not only because of the wonderful pigments, materials and technical knowledge we have today but also because we have increasing access to visual information and a broader range of cultural ideas. 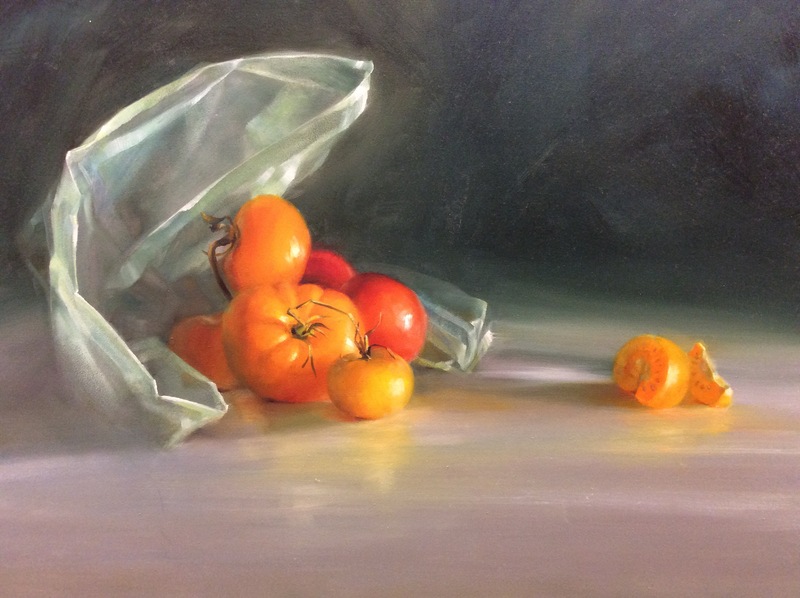 Little Tomatoes, Big Adventure by Tricia Ratcliff: oil on canvas, 18in x 24in. What a beautiful interview! Trish’s lovely personality is showcased here, as is her incredible artistic talent!